Vaughn Velocity V6 1100i Int. Chest & Arm Pad | Sports Etc. The 1100i intermediate pro arm and chest pad is an enhanced design to fit the young adult goaltender that needs the maximum protection and performance, but does not yet have the full body size or weight to fit into a full adult size. Extra layered sternum plate provides additional reinforcement to the sternum area and has an added layer of Carbon fiber for ultimate protection. 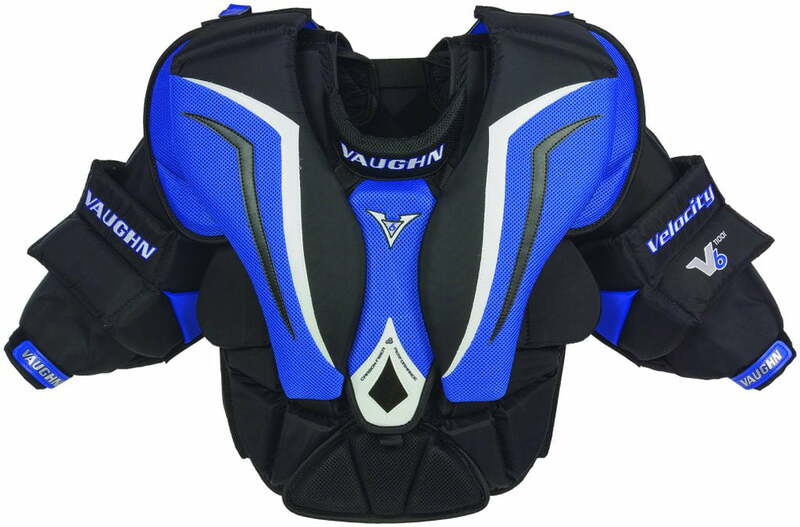 Full pro thickness chest protector ensures maximum protection for any age or level of play. Sports Etc Performance To Value Rating– 9 out of 10. Perfect chest pad for a young adult or teenager that needs the protection of a pro chest pad, but can only fit into an intermediate size.